Many food ingredients labels list evaporated cane juice as one of its ingredients. Is this just another name for sugar, or is there a difference? Like sugar, evaporated cane juice comes from sugar cane; however, it typically undergoes less processing than refined sugar. Because of this, evaporated cane juice contains the nutrients from sugar cane processed out during the refining process for table sugar. Many manufacturers tout cane juice as a healthier alternative to sugar. Sugar cane is a source of riboflavin (vitamin B2). One ounce of cane juice contains about 10 percent of the recommended daily allowance for riboflavin. Cane juice has four calories per gram. Once ounce contains 111 calories. Cane juice also contains a small amount if niacin, calcium, magnesium, manganese, and potassium. There are many misconceptions about cane juice. Cane juice is not an artificial sweetener. It is also not a low-calorie sweetener. It is not a low-carbohydrate alternative to table sugar. It is not a low-glycemic alternative to sugar. It is not a diabetic friendly food. It is not a diet food. Unless it is listed as such, it is not organic. The different types of cane juice are processed differently; however, in general, manufacturers extract the cane juice from the sugar cane and then allow the liquid to evaporate and crystals to form. Milled cane contains yellow or gold crystals and a slight molasses flavor. Muscovado has coarse, uneven, dark crystals and a marked molasses flavor. Demara sugar has large, pale yellow grains and a moderate molasses flavor. How does cane juice compare to sugar? Both have a similar affect on blood sugar. The two can be used interchangeably in a recipe. Both contain four calories per gram. Cane juice products are slightly darker in color than refined table sugar. Sugar is the more refined of the two. Some sugar comes from sugar beets, as well. Cane juice always comes from sugar cane. Because manufacturers make less cane juice than refined sugar, the cost is typically higher than that of table sugar. You can use cane juice in most recipes in much the same way you use sugar. Muscovado sugar makes a good replacement for dark brown sugar, and demara is popularly used in coffee shops as a "gourmet" replacement for table sugar. Not all grocery stores sell cane juice; however, if they do it will be in the sugar aisle under one of the names listed above. Gourmet shops and higher end grocery stores are more likely to carry cane juice products. If you are seeking sweetness without totally empty calories, then cane juice products will provide a small amount of vitamins and minerals; however, nutrients aside, cane juice has the exact same effect on your body as other types of sugar. 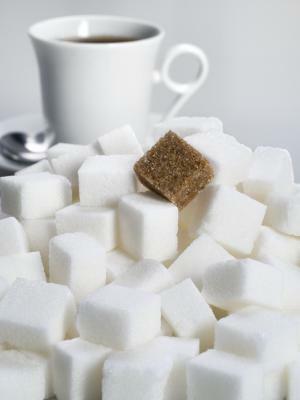 If you are trying to lose weight or manage diabetes, use all sugar products including cane juice sparingly.